Since skincare is a huge part of what I enjoy, I am thankful to have amazing opportunities to test out different products. 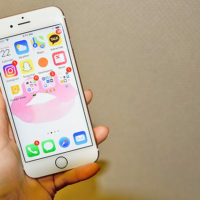 However, when I started getting an influx of products, I realized that I couldn’t keep up with what I was putting on my face and was actually damaging my skin. Last year, I discovered the “clean beauty” world, and it was shocking to realize what kind of toxic ingredients I was putting into my skin. I thought I was being smart by avoiding certain ingredients, but there were FAR MORE to the list. And it immediately clicked why I break out occasionally in certain areas, and why I react to certain products more than others. 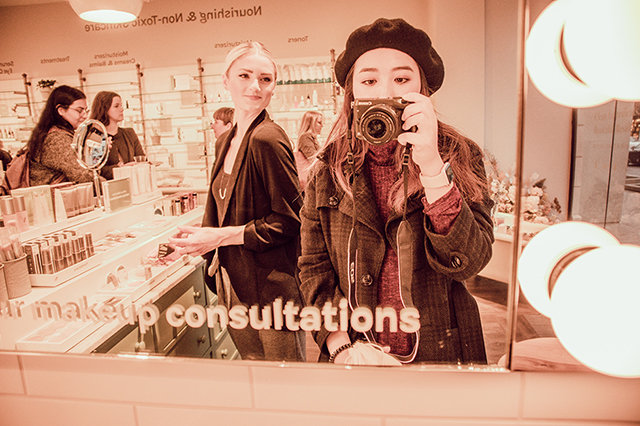 This is when I discovered stores that sell clean, non-toxic beauty products like Credo and Follain. 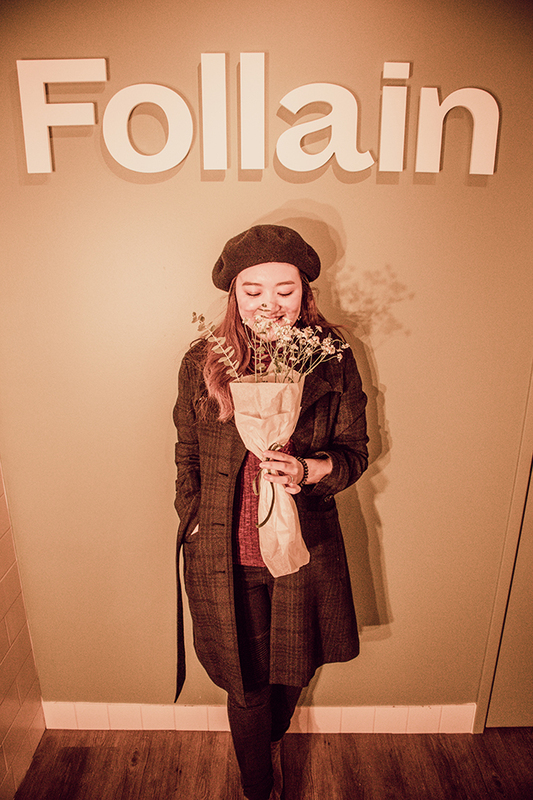 Although some brands overlap between these two stores, I stop by Follain more because of the brand, the employees, and the strict restrictions list. Everytime I visit Follain, I come back with a new fact that I did not know about. These pictures are from a happy hour event I was invited to a couple of weeks ago, and I had an amazing conversation with one of the employees there. I learned that the pores in our scalp are 2-3 times bigger than the pores in our face. So imagine feeding all those toxic haircare products when you’re taking a shower…! Although my original intent for approaching clean beauty was for skincare, I am now on the journey to switching out haircare, body care, and makeup products as well. Mental awareness- How scary is it that I’m putting toxic chemicals into my system? I have limited control over food and the environment, BUT I can control what I put in my body and face. 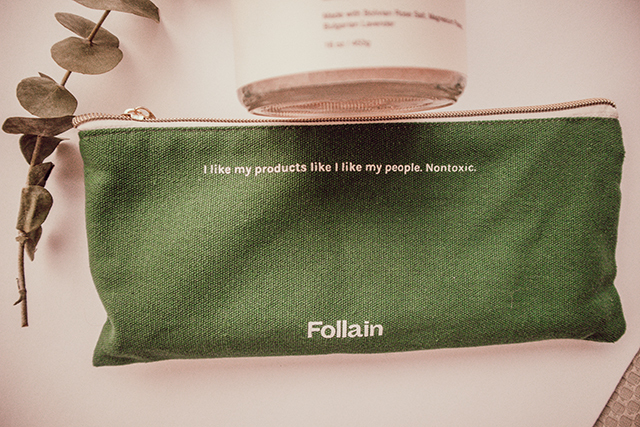 Some products I discovered at Follain have definitely helped me make that switch and see some good results, and also feel better about myself. 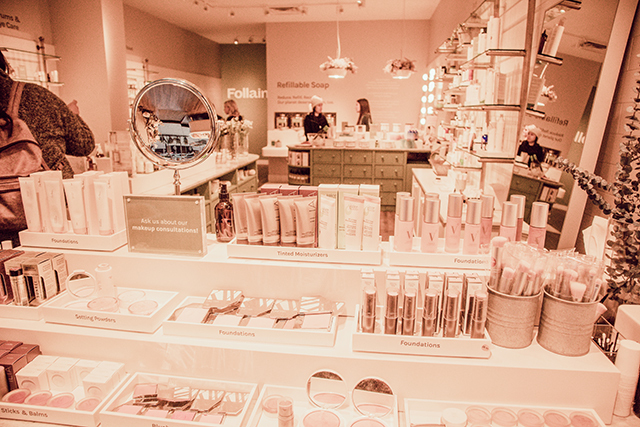 And don’t get me wrong- Follain is not the only place you can find clean beauty products, but I just wanted to share my experience and also because I trust this brand and the company. Some people may have the budget to switch out their vanities entirely at once, but I definitely don’t. However, I do see the importance of switching over to clean beauty as much as possible. I also see that not ALL products may work for me just because they are considered clean, organic, and non-toxic. 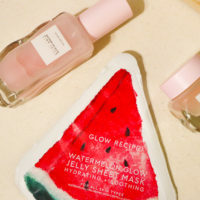 Therefore, I’ve been trying to discover different clean beauty brands (I did not realize there were so many! ), sampling products, and switching out one product at a time in different beauty categories that work for me. New to Clean Skincare? Here’s How You Can Start! You don’t have to use my code, but if you do, it’ll help me produce more content like this! The Clean Essentials Kit is a good starting point. 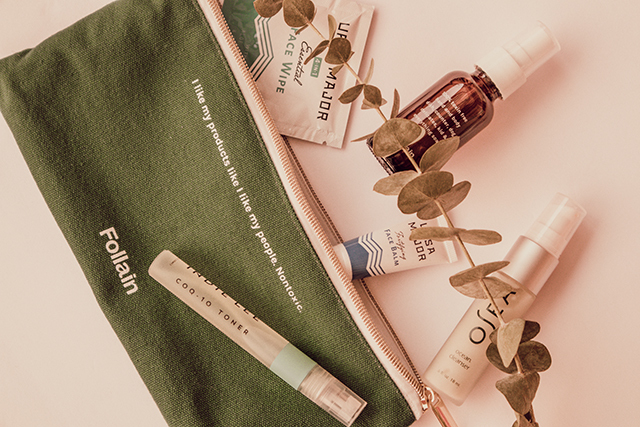 You will get the Osea Ocean Cleanser, Indie Lee CoQ-10 toner (my favorite), Ursa Major Golden Recovery Cream, Follain Refillable Soap, a green Follain pouch, and a $10 offer in the pouch. Please note that my kit is slightly different than the one currently on the website. You can get 15% off of this kit using the code ref15_6nqmfl.